Be ready to taste the best pickles EVER! These Horseradish Pickles are made from an old family recipe. Crunchy, sweet, and spicy...a party in your mouth! Pickles might be one of the greatest things on earth! I love sweet, spicy, tangy, hot, fried, and just about every other pickles there is. 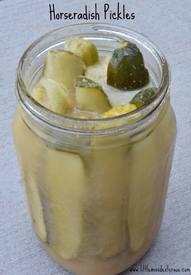 Coming from an old family recipe, these Horseradish pickles top the charts! The sweet and spicy flavors melding together are really what make these pickles stand out! Some like it hot, others don’t! You can alter the heat in this recipe to your liking. However, the ‘zing of the horseradish gives these pickles the BEST taste!